Don't let hearing loss keep you from talking! An amplified phone can help your conversations! Do you suffer from loss of hearing? Have you wanted to talk on a phone but are just unable due to your loss of hearing? There are many problems associated with hearing loss but having a phone does not have to be one of them! An amplified telephone can give you the required volume of ring tone and voice hearing that you need in order to talk naturally on a telephone. Whether you suffer from moderate to severe hearing loss, an amplified phone can greatly improve the quality of your conversations! There are many different things to consider when buying an amplified telephone. Some research and helpful hints can get you on your way to owning the perfect amplified phone for your needs. There is no reason that you cannot have a pleasant conversation with your loved ones. Amplified phones are the perfect solution to those suffering with hearing loss. There are some things to consider when purchasing a new amplified phone. First of all, there are two different factors in a phone. Whether you have hearing loss or cannot speak loudly, an amplified phone can work for you. If you have hearing loss, a phone with incoming voice amplification would be suited for you. If you have both hearing loss and voice problems, there are phones with both incoming and outgoing amplified hearing. Secondly, you need to consider your type of hearing loss. Whether it is high frequency or low frequency, there is a phone that will work best for your situation. Also, your degree of hearing loss will impact what type of phone you need. If possible, find out what decibel hearing loss you have. Doctors and hearing aid users can help you with this calculation. There is also the question of whether or not to go cordless. If you are mobile and need the freedom to move around while talking on your phone, then a cordless phone would be most suitable. Lastly, think about the special features you may be looking for in a phone. Would you like a caller ID with your amplified phone? Could you benefit from using speakerphone? There are many different features that come with phones, and amplified phones are no exception. Just because you are hard of hearing does not mean you cannot enjoy the comforts of talking on the phone with loved ones. Amplified telephones are a great way for you to keep in contact with your friends and family at your convenience. 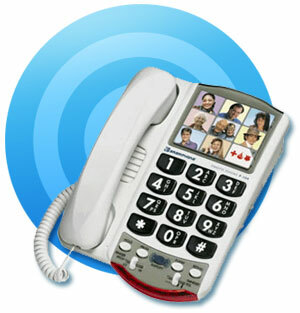 Amplified phones do not cost much more than a regular phone, and can be delivered straight to your home! There is no reason to continue on straining to hear on the phone or simply ending your conversations all together. An amplified phone will benefit you as well as your loved ones you talk to. Whether you have minimal hearing loss or are almost deaf, the right phone is waiting for you. Don’t spend another day wishing you could talk to long distance friends and family. Consider buying an amplified telephone for yourself today!